MANILA, Philippines – A young songwriter from Davao, Chud Festejo has a curious opinion for the popular children’s clapping game Nanay, Tatay. Why does the chant make the children sound demanding? Convinced that there is a bigger reality to be addressed, he started writing a song that will then win the hearts of the judges and the crowd of PhilPop 2018. 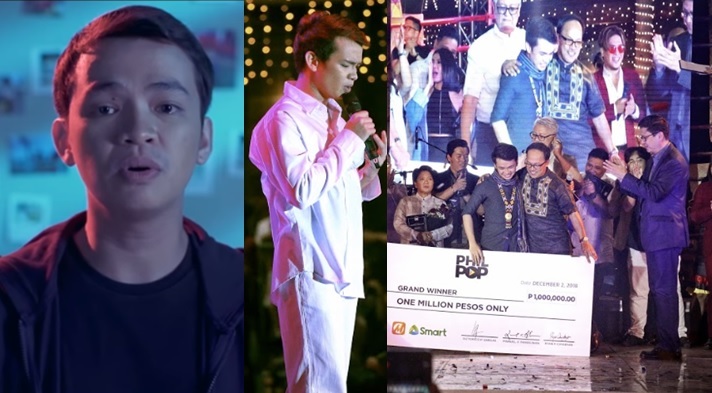 Nanay Tatay, written and performed by Festejo, was the winning piece that hailed him the Grand Champion among the ten finalists who competed during the PhilPop Finals Night 2018 held recently in Capitol Commons, Pasig City. “Of course, happy. Kahit na sa 30 songs, andaming magagaling. Ngayon, I still can’t explain how I feel,” Festejo shares, acknowledging the tough competitors he had during the contest run. Festejo won the grand prize of P1 Million. Nanay Tatay is a song that talks of the “innocence and vulnerability” of child beggars— naive of the world they live in, and susceptible to the harm society might inflict to them. 'Nanay Tatay' is composed and interpreted by Chud Festejo. The song gives off a dark feeling, arranged with an eerie “horror” scoring combined with a horrendous social situation for a message. “Kinonek ko ‘yong horror na feeling and ‘yong social situation na nakakatakot ‘pag nandoon ka,” Festejo says. “Hindi sya sung usual eh. Andaming mga strong performances. But the performance (of Nanay Tatay) was still really strong, as in I got teary-eyed listening to it. It was a sure won for me. I was happy na, apparently a lot of people like it.” Veteran artist and composer Ms. Trina Belamide, who is among the roster of judges, expressed her delight with the result. The 1st Runner Up for the competition was Ferdinand Aragon, with his love song ‘Di Ko Man, which he, too, himself interpreted. The song, written in Bisaya, is a “contemporary harana”.